Netanyahu meets with top army brass in order to plan next moves with Gaza as rockets reach Be’er Sheva for the first time in four years. Prime Minister Benjamin Netanyahu held a security assessment of the escalating situation vis a vis Gaza at the IDF’s headquarters in Tel Aviv. Following the meeting, an Israeli official said that “Hamas suffered a severe blow. 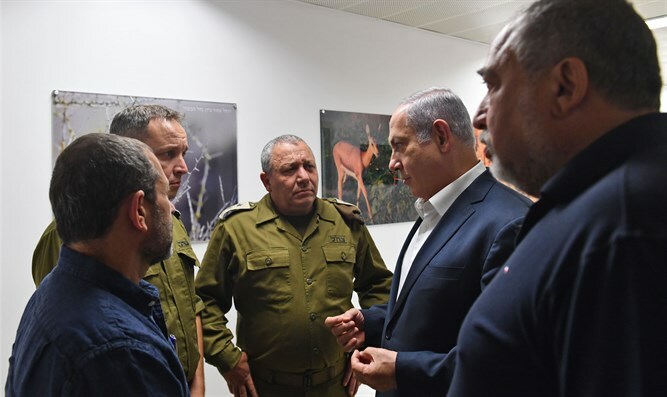 Israel will continue to act with force.” During the meeting, Prime Minister Netanyahu and Defense Minister Avigdor Liberman instructed the IDF to prepare for any possibility should the situation deteriorate further. Netanyahu is scheduled to hold a meeting with the political-security cabinet at 6 PM. For the first time since 2014’s Operation Protective Edge, a rocket exploded on the outskirts of Be’er Sheva. No casualties were reported. Police sappers defused the rocket. Since Wednesday evening, more than 180 rocket launches from the Gaza Strip have been landed in Israeli territory. The Iron Dome missile defense system intercepted more than 30 of them and most fell in open areas. Israeli Air Force fighter jets attacked a number of terrorist cells along the Gaza Strip in response, including a military compound of the East Rafah battalion, a shaft of a Western combat tunnel west of Jabalya, and two tunnels adjacent to the coast in the central Gaza Strip belonging to Hamas. The IDF said Saturday that a blast the previous evening on the Golan Heights was from a bomb detonated as patrolling troops passed by, but that there were no casualties. Kiryat Arba residents: No Jerusalem Arabs as bus drivers Kiryat Arba residents fear for their families' safety after Egged Ta'avura employs Jerusalem Arabs to run bus lines.